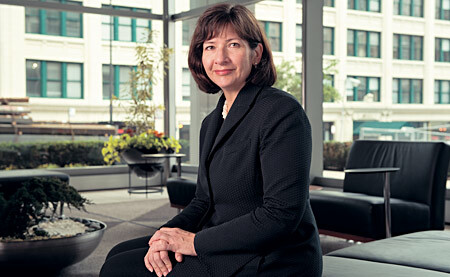 When Kristie Paskvan entered the Kellogg School's Executive MBA Program in 1995, she had already achieved the level of chief financial officer at Stein & Company, a real estate developer responsible for projects that included Chicago's AT&T Corporate Center and the Metcalfe Federal Building. She also had gained experience in real estate portfolio management and public accounting. So her return to school was marked by the pressures of balancing life as a senior executive with her responsibilities of completing homework and preparing for exams. "It was challenging but really invigorating," she says, noting that even as a seasoned professional, she took away deep lessons from her finance classes while applying formal concepts to many of the behavioral aspects she had observed during her career. In addition, the Kellogg program's team-based learning approach that exposed her to peers from a variety of industries. "I got a full view of how people feel about their careers and their companies." Her interest in understanding how others relate to their professions was a main motivator for her enrolling at Kellogg. In particular, she was attracted by the school's Management and Organizations curriculum and its emphasis on collaboration. "I was at a point in my career where the qualitative aspects were what I wanted to improve," Paskvan says. "If you're going to lead, then you have to be able to listen and to learn. The interpersonal dynamics are very important." Attention to those dynamics proved invaluable as Paskvan's graduation approached. In 1997 Stein was acquired by Mesirow Financial, the largest independent financial services firm in Chicago with $32.2 billion of assets under management. Immediately after coming aboard as a senior vice president, Paskvan was handed responsibility for planning and analysis of the six different businesses that comprise the company. Paskvan describes that role — which involved overseeing the budgeting of each division — as equivalent to "changing jobs" each time a different unit was analyzed. Immersed in a new learning environment, Paskvan thrived, earning her promotion to CFO of Mesirow Financial in 1999. "I was very lucky to be given the opportunity to lead the accounting and finance team," she says, noting the importance of mentoring at the company. Her new role provided an ideal opportunity to bridge leadership theory and practice, even as she oversaw the accounting and finance areas for the company. In fact, Mesirow Financial's main source of growth — mergers and acquisitions — often extends beyond traditional due diligence. Paskvan estimates that in the last 25 years the company has consummated over 50 deals, with acquisitions ranging from small teams of people to entire businesses. Says Paskvan: "It's not always about the numbers. Sometimes it's about the people [at the firm we're targeting] and knowing what they're capable of if they're given the support that our company can offer. We have someone with us who was running his own business, and who really brought to us the ability to provide currency management. He was just a great fit." Now that team's currency management expertise has grown to where the group is managing over $8 billion in institutional assets, Paskvan reports. Not only was the team able to provide currency hedging to one of its alternative strategy businesses, but the business leader no longer had to focus on the administrative aspects of his business. "Those areas are now taken care of for him so he can focus on clients," she says. While assessing past performance and future potential is critical to a successful acquisition, Paskvan believes that creating the right environment and then leveraging talent is equally important. "Just like at Kellogg, when you're building teams you need to develop a sense for who's good at what," she says. "Very early on, you get an idea about shared values and whether a person really wants to become part of Mesirow Financial and can truly take advantage of the growth we can provide."